contrary to all the women out there that hate it when men say this…i’d have to agree and say that the kitchen is definitely where i belong. for me, there’s just something so peaceful and therapeutic about chopping fruits and vegetables, kneading dough, sauteing mixtures, stirring soups…all to result in a final delicious creation that you can eat and share with loved ones. it’s been a crazy few weeks and even after keeping myself distracted with other things, the one place i still love the most is the kitchen. cheers. tonight’s mom & daughter meal was kept very simple. 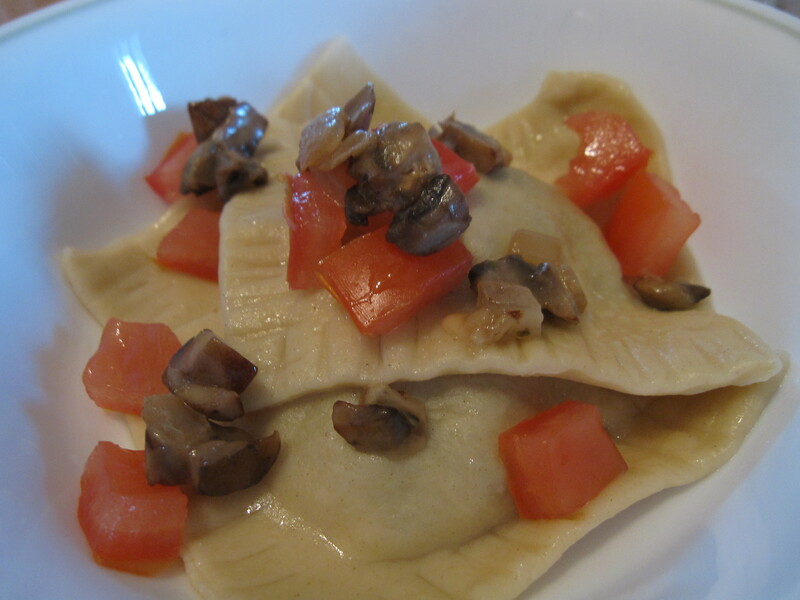 ravioli filled with mushroom, onions, and cheese. no lobster, shrimp, or beef for my mom or else i would have gotten more creative with the filling. dough: 1 cup of flour, 1 egg, and 2 tablespoons of water. knead dough together into a ball and let sit covered (with dry paper towel) for 15 minutes. run dough through pasta maker machine (down to setting #5). 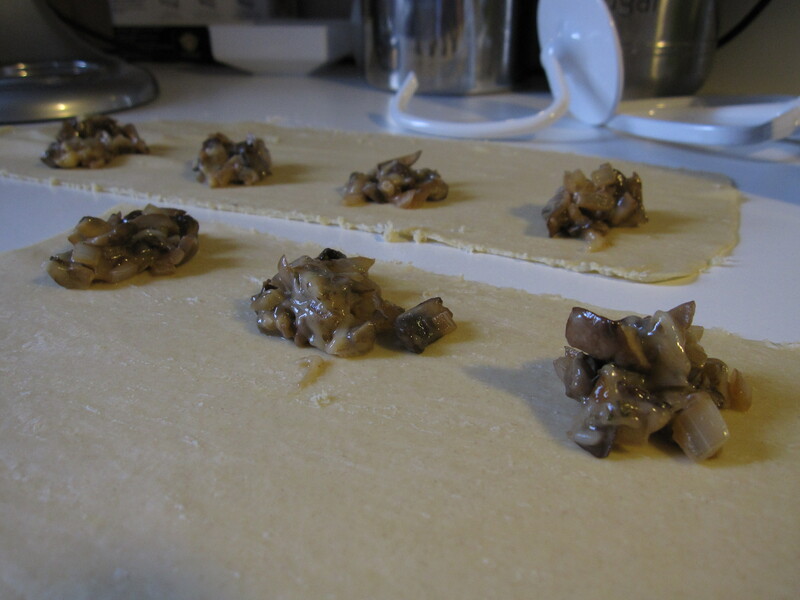 filling: chopped mushrooms, chopped onions, shredded italian cheese, italian herb seasoning. 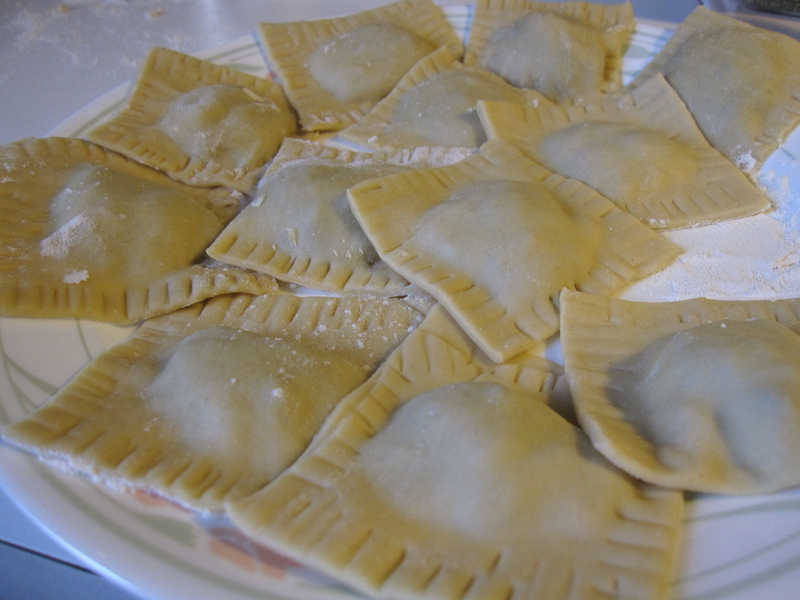 fold over to make ravioli pockets. use knife to cut into pieces. press ends with fork. boil in water for 6-7 minutes, or until done. add EVOO to the water so the ravioli don’t stick to each other. usually, i would have made a sauce, but decided to keep tonight’s dinner extra simple and healthy – garnished with leftover filling and chopped tomatoes.